Palestinians deliberately drove a car into Israeli troops in the occupied West Bank on Monday and two of the attackers were shot dead after critically injuring an officer, the Israeli military said. Describing the incident as a car-ramming, the military said a third Palestinian in the vehicle was slightly wounded after the troops opened fire. The attack occurred when soldiers stopped their vehicle on the roadside at night about 10 km (six miles) northwest of the Palestinian city of Ramallah, the military said. Israeli media reported their car had broken down. 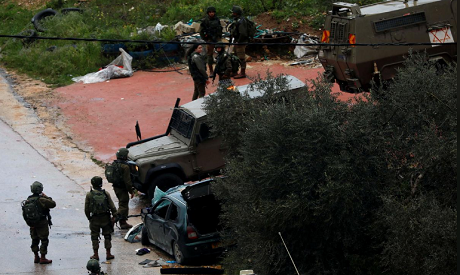 Soldiers fired at the Palestinian car after the ramming, killing two of its occupants, a military spokeswoman said. The Palestinian Health Ministry confirmed their deaths. In addition to the Israeli officer seriously hurt in the incident, a soldier sustained light injuries, the military said.